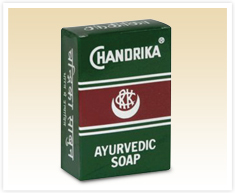 Chandrika Ayurvedic Soap is the original vegetable oil soap, first launched in 1940. This soap is made with purified coconut, sandalwood, and patchouli oils. It does not and never has contained any animal fat or products, and is not tested on animals. Chandrika is the real secret of natural beauty and puts nature to work at caring for your skin. Chandrika has been trusted by millions of people for nearly seventy-five years now. Isn’t it time you discovered why?